I’ve been telling people to come visit me since the moment I stepped foot in this place, more for their sake than mine, and last week in one day I got the news that I would soon have not one but two visitors – a good friend at the end of this month, and my baby brother this past weekend. It was super short notice, but I didn’t ask any questions, and a little more than a week after his first text message he was sitting in the Moab airport waiting for me. Driving around this country with someone who doesn’t know it is like coming back for the first time yourself. As amazed as I am every day by the things around me, I am sorry to report that there are a few things I have gotten used to – like the way the rice grass glows at sunset, or the shock of deep red color in the rocks against a vibrant blue sky, or the warmth and kindness each person I live and work with possesses. Having my brother around and watching him experience all of these things for the first time was almost as exciting as my own first encounters. Almost. I had to work in the morning of his first day here, so I met him in the afternoon and took him on a tour of the park. We hit the major overlooks and took two short hikes up Whale Rock and Upheaval Dome. I completely geeked out and went into the miniscule details of everything we saw, and he was patient enough to nod his head and smile. At the rim of Upheaval Dome I dropped the cap to my water bottle, which made quite a dramatic fall to the bottom. I went on to spend the majority of the hike down complaining about the tourists anyway, even though I knew my discretion had been just as silly as any of theirs. We had to cut our explorations off early however, as it was the birthday of one of the rangers, and I was tasked with the cake and ice cream delivery. We went to bed early that night, vowing to wake up just as early to get in a few good hours of climbing. But it wasn’t meant to be. We met sleepily in the kitchen around 10:30, and didn’t make it to the rocks until noon. Climbing was one of the things I was most excited to show my brother. It’s an exhilarating sport that I have absolutely fallen in love with out here and that I suspected he might take to. What barely teenage boy wouldn’t like climbing to the top of giant rocks on the very tips of your fingers and toes? But by the time we got to our spot of choice, the rocks were hot from the sun. We set up on an easy route anyway, and just as I suspected, he took to it right away. I would have liked to have spent more time climbing, but just as he finished his climb it started to rain, and since our rope wasn’t made to get wet, we had to clean up and head out fast. 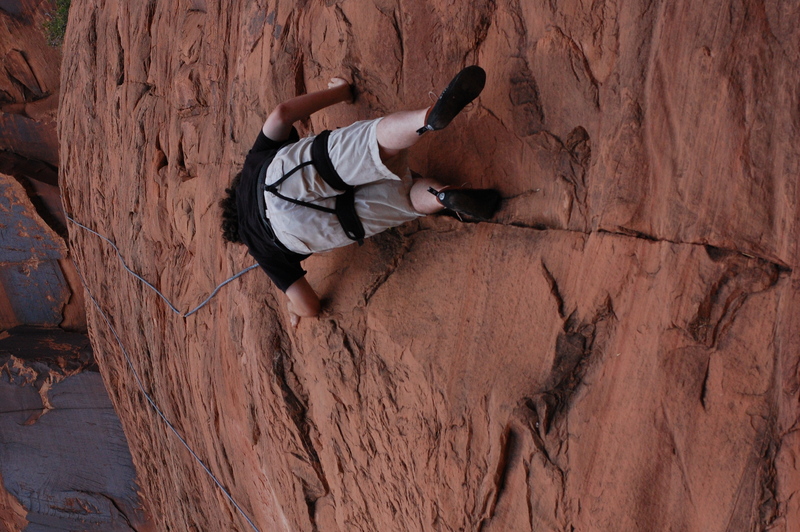 Bryan on his first red rock climb! 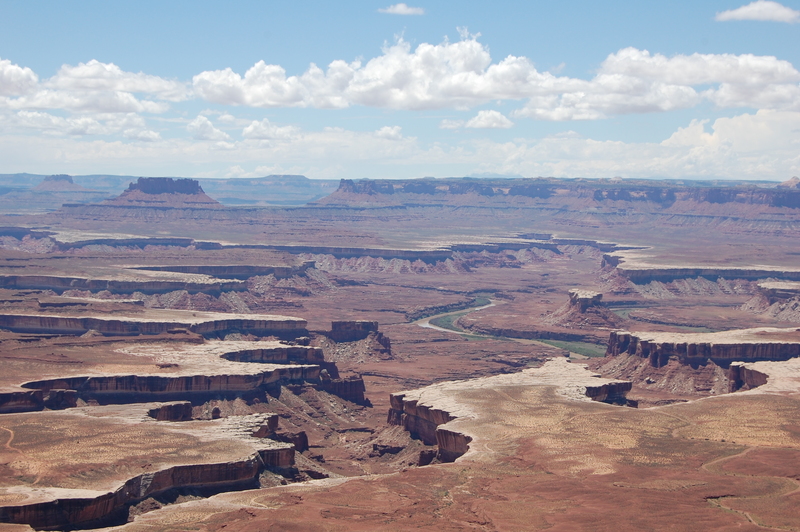 In the afternoon we met up with Nathaniel and Sierra, two of the permanent rangers at the park, to go potholing at Dead Horse Point – the state park nearby. Nathanial being a seasoned photographer and general know-it-all, had promised to teach Bryan a few new things about his camera. We ended up spending two hours on our hands and knees, watching the drama unfold in the potholes, and I was pleasantly surprised to find Bry right there along with us, delighting in our nerdy fun. 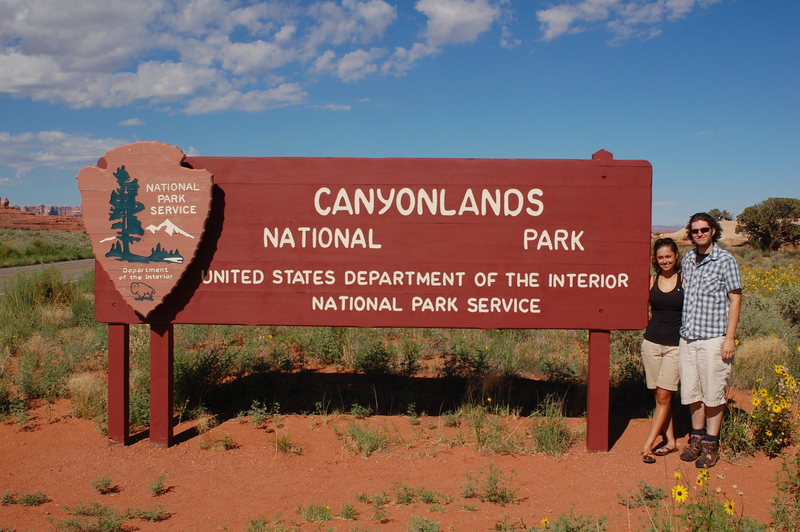 Since we had taken it pretty easy for the majority of his visit, we decided to do one hard day of hiking before he headed home, so on his last day we woke up at the crack of dawn to set out on the 2 ½ hour drive to the Needles district of Canyonlands. After an incredibly frustrating delay (my car keys went missing, and have yet to be discovered), we arrived at the trailhead about an hour late. My housemate Kathryn had come along for the adventure, and we had decided on a ten-mile hike called Peekaboo Trail, which would eventually lead us to a pictograph covered wall and canyon spring. You are beautiful I love the way you write your adventures, hope I get to go some day. Your baby bro is a lucky boy.